The city of Kagoshima, with a population of about 600,000 people, is the southernmost large city of the Japanese archipelago, and is located in the southern end of Kyushu. The Sakurajima volcano, which stands on an island in front of the city, is the main landmark of Kagoshima, making it similar to the Italian city of Naples and its Vesuvius. The two cities are twinned. The center of the city of Kagoshima is all that area around the street connecting Kagoshima station and Kagoshima Chuo station, the latter one is the most important station of the city, served by shinkansen high-speed trains. This street is well served by the city tram. In particular, the commercial heart of the city is located near some covered arcades (shotengai), Tenmokan Dori and Sennichi Dori, and Bunka Dori. Also in this area there are the city's oldest department stores, Yamatakaia, and a modern popular shopping center, known as Dolphin Port, located in front of the sea, with many shops and restaurants overlooking the bay and the Sakurajima volcano. Another area full of vitality, shops, hotels and restaurants, is that around the Kagoshima Chuo Station, where there is also the huge shopping mall Amu Plaza with its 91 meters high ferris wheel (500 yen a ride, opening hours 10-23). The city of Kagoshima is quite famous among the Japanese cities, but mostly for its volcano, not because it is a city full of things worth visiting. The main attractions are listed below, all of them can be reached easily from the central area by tram or sometimes also on foot. Located near the port of the city, this aquarium mainly showcases the local fauna, with areas dedicated to Kagoshima Bay and all those islands located just south of the coast of Japan: Yakushima, Tanegashima, Iwo Jima, Tokara islands and the archipelago of Amami. 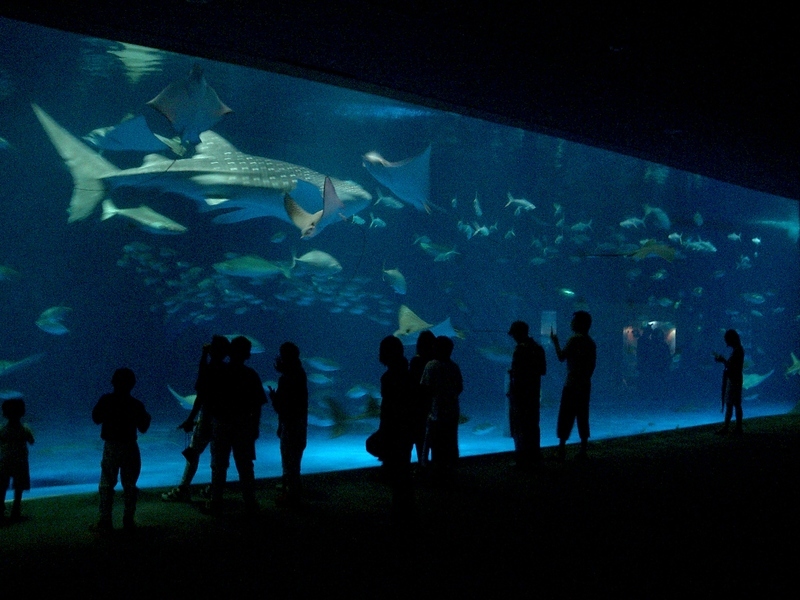 Another attraction of this aquarium are the shows with dolphins organized 3 times a day at fixed times (4 times in the weekend). Moreover, in the intervals between shows dolphins are occasionally brought outside the aquarium and they're free to swim in the canal in front of it, so if you are lucky you might observe them for free without having to pay the admission ticket. A large traditional Japanese garden, whose wonderfullness might be enjoyed in peace without anyone around you, due to some reasons such as its large size, its expensive admission fee and the fact that Kagoshima is not so popular among tourists. This garden is highly regarded as a "work of art" as it combines the artificially created landscape within the garden with the natural scenery surrounding, then using the bay in front of it as "pond" and the Sakurajima volcano as background mountain. At the center of the garden there is the Iso Residence, whose current building is a reconstruction of the late nineteenth century. Many years ago this building was the home of the Shimazu Clan, the same clan that in 1658 had built the whole garden. You can visit the interior of the residence by guided tour (600 yen) which ends with a tasting of tea and small snacks. The 1000 yen ticket for the Senganen Garden also includes the entrance to this museum located nearby, in what was once a shipyard of the Shimazu family, which in the second half of the nineteenth century were among the first to use industrial technologies from the West. The theme of this museum is right the Shimazu family, their commitment and industrial technologies coming from the West that contributed to the modernization of the country at the end of the nineteenth century, as well as some temporary exhibitions changing over the months. A park that covers a hill located in the middle of the city of Kagoshima, 107 meters high. On September 24, 1877 on this hill took place the so-called Shiroyama Battle, during which died the main protagonist of the last rebellion of a samurai against the Meiji government (Satsuma Rebellion), Saigō Takamori, the famous movie The Last Samurai is inspired by this story. Today the park is mainly famous for the beautiful views, beyond description at sunset, over the city of Kagoshima, the sea and the Sakurajima volcano in the background. On this hill there is also a great hotel with an onsen from where you can admire exactly this beautiful view while relaxing in the hot springs, the Hotel Shiroyama Kagoshima (more information further down). This castle, also known as Kagoshima Castle, is located at the foot of Mount Shiroyama. It was built between 1601 and 1606 and it was destroyed in 1873. Today you can only see the moat and the walls of the castle. A museum called Reimeikan is located within these walls nowadays. The Reimeikan (Kagoshima Prefectural Center for Historical Material) is a museum dedicated to the history and culture of the prefecture of Kagoshima, ranging in time from the Paleolithic to modern times. 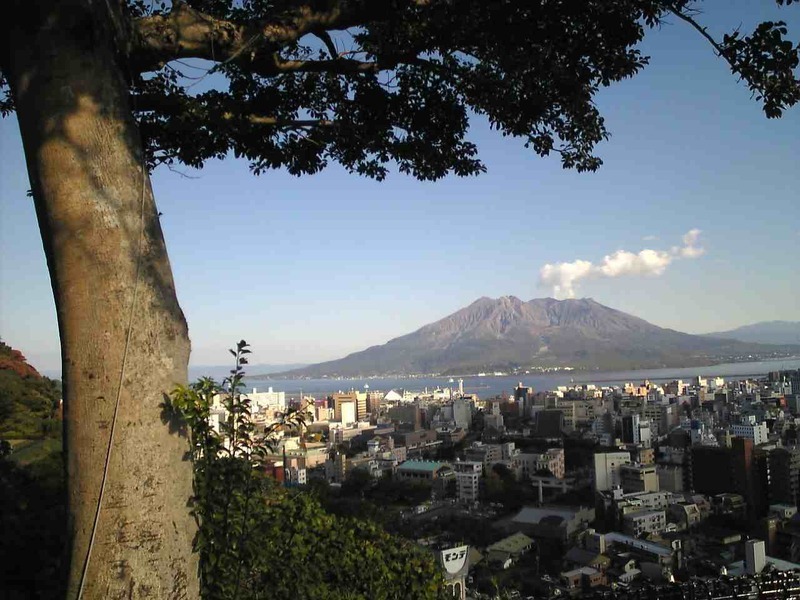 The island of Sakurajima is the most famous place of Kagoshima, and definitely its main landmark. On this island stands one of the most active and studied volcanoes in the world. You can find more information about Sakurajima here. Small guesthouse in a great location, just a few minutes from the shopping area of the city, the tram stop and the waterfront. Beautiful panoramic terrace on the roof of the building, a perfect place to meet other guests. Dormitory beds from 2000 yen per night, and this price makes this place one of the cheapest ever in the city of Kagoshima. Double and triple rooms are also available. 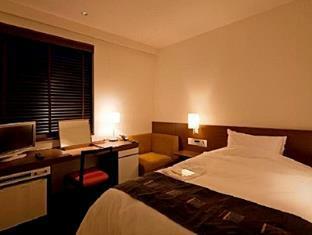 Japanese business hotel chain known for its excellent value for money, with prices that generally are among the lowest. 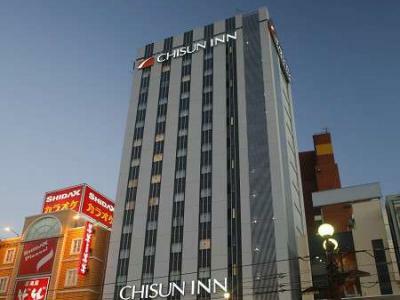 The Chisun Inn of Kagoshima is located in a great location, in the commercial area of the city and a few meters from the seafront. 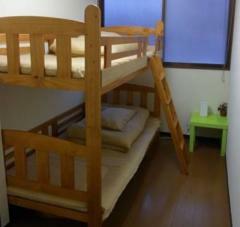 Single rooms from 4,000 yen per night. This hotel is located in an excellent location, in a few minutes you can reach the main shopping street of the city, served by the tram, the seafront with its parks on the coast and the Dolphin Port. Excellent service and rooms, comparable to a 4 stars hotel except for the size of the rooms, which are still quite tiny as it often happens in Japan. Singles from 4,600 yen per night, double from 5,900 yen per night. This hotel is perfect if you want to stay near the station served by the shinkansen (Kagoshima Chuo). The hotel is directly connected to the station and the surrounding area is very lively and full of shops and restaurants, just a few meters away there is the Amu Plaza and the tram stop. Modern, spacious and well equipped rooms. Single rates from 6,000 yen per night. Big luxury hotel located on a hill near the city. 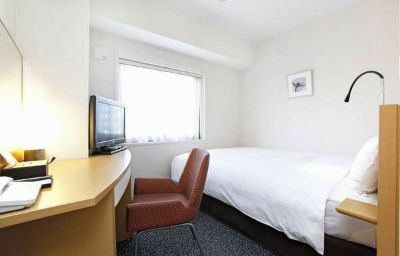 It is not right the ideal location for a short visit to the city, but the hotel offers free shuttles to the center and to the Shinkansen station. Instead, it is ideal if you want to combine a visit to the city with a few moments of relaxation, here you will find delicious restaurants, a spa, sauna, and a spectacular onsen overlooking the sea and Sakurajima. Some rooms also have views of the sea and the volcano. Rates start from about 10,000 yen per night per person. Kagoshima is located in the southernmost part of the region of Kyushu, the southernmost region of Japan, so it can be a long journey to get there from northern Japan. Kagoshima station is the last stop of the Kyushu shinkansen, the high-speed train connecting Kagoshima and Fukuoka (100 minutes, 10,000 yen). Fukuoka (Hakata station) is itself the last stop of the Sanyo shinkansen, therefore by changing in Fukuoka you can get to Kagoshima by shinkansen from many cities further north, such as Osaka (4 hours and a half) and Hiroshima (3 hours). From Tokyo the whole trip takes at least 7 hours, to be taken into account only if you have Japan Rail Pass. Kagoshima airport (KOJ) is well connected with major cities of the country. If you do not have the Japan Rail Pass, the plane is undoubtedly the best way to reach the city of Kagoshima from Tokyo, Nagoya or Osaka.